Why on earth would someone choose to sign up for an account on an online dating website? Why can’t they just go out on the town and try to meet someone that way? Are people really that desperate to drop their single status? I feel like these are all questions someone asks about those who decide to seek out love on sites like Match.com and eHarmony. While a lot of the stigma revolving around online dating has lessened over the years, it seems like a lot of people still view it as something almost taboo or straight up dumb. 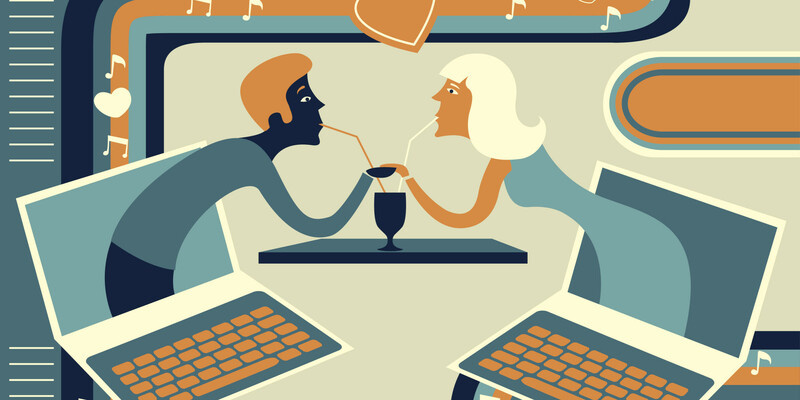 According to Pew Research Center, people who choose to try online dating is on the rise, but it isn’t nearly as popular as many commercials like to proclaim. I always hear eHarmony claiming to have millions of users and how so MANY PEOPLE have met their spouse on the site. However they never actually throw out percentages when talking about the success the business has had. An article I read said, “Some 11 percent of people who started a long-term relationship in the past decade say they met their partner online. Even so, only 10 percent of Americans say they’ve tried online dating.” That doesn’t really seem like a lot of people to me. I can think of one person in particular who met their spouse online. A woman at my church, Kelly, signed up for eHarmony years ago and met Danny, a model who was currently living in New York. I obviously don’t know all the details because this isn’t my story, but I do know that they talked a lot and Kelly eventually traveled to New York to meet Danny with some of her family members. They truly hit it off and visited each other a few more times before getting engaged and then getting married. They now live back in Missouri and have two crazy kids that they love so much. It was pretty cool to get to witness two people meet like that. Even though I would never sign up for online dating, especially now since I’m married and want not, I do realize that many people have found love and happiness through such a thing. You can’t simply write off online dating just because you wouldn’t do that. It really does work for some people. A survey done by Pew Research Center discovered that attitudes towards online dating has grown more positive from 2005 to 2015. Even though not as many people as you might think try online dating, it has become a lot more acceptable over the years. The idea of finding someone online has even grown to include finding someone to cheat on your spouse with and finding a random person to hook up with in your area. I certainly don’t agree with these types of “dating” websites/apps, but apparently other people beg to differ because these types of things still exist. As I said before, online dating has grown in popularity over the years, but a lot of people still meet their spouses in person. I’m not saying you shouldn’t give online dating a shot if you’re really feeling it, but I want you to know that just because you haven’t found someone to commit yourself to yet, that doesn’t mean it isn’t going to happen. You still have tons of time to find that special someone. You might already know of someone who you’d like to pursue. You might meet them at your job someday. Heck you might even meet some random hottie at a local coffee shop, you never know. And you might one day find “the one” on Match or eHarmony. All i’m saying is that there are so many different ways to meet someone these days and you shouldn’t discount any of these options because you just never know what might happen. Newer Post Digital Relationships Podcast	Older Post Is having digital relationships healthy or not?